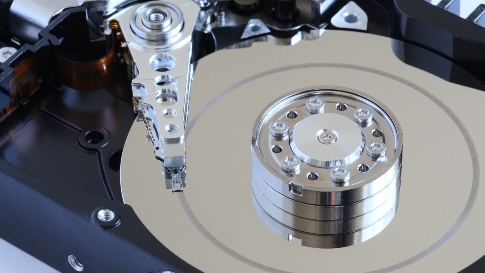 As your computer’s hard drive gets full, it can begin to seriously affect your performance. It’s a good rule-of-thumb to never exceed 75% of your hard drive’s capacity. Once your hard drive storage begins to exceed that level, it’s time to do some cleanup. 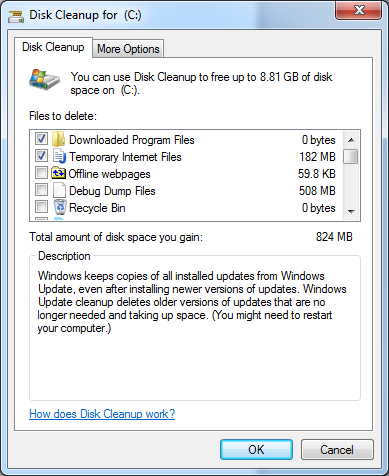 One of the most overlooked tools for maintaining a healthy and responsive computer is Microsoft’s built-in Disk Cleanup tool. This utility has been around and included in Microsoft’s operating systems for two decades now, ever since Windows 95 was released. This single tool can help you free up disk space, remove temporary Internet files that may be slowing down your computer, remove unnecessary software you may have forgotten you installed, empty your recycle bin, remove old backups, and even compress unused files. It is one of the safest ways to boost your computer’s performance and clear up hard drive space. To open the Microsoft Disk Cleanup utility, click the Windows Start button, select All Programs, Accessories, System Tools, and finally… Disk Cleanup. 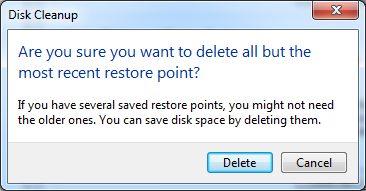 This is where you get to decide what you want to delete (as if you knew what was safe to delete). So the first question you’re likely to have when you get to this point is whether or not it’s actually safe to delete these files. In most cases, the answer is yes. But, just to set your mind at ease, let’s take a look at each of the items available so you know what they are. When you browse the Internet, the web pages you visit may automatically download files that help their website function and display correctly within your browser. If the files are not on your computer the next time they are needed, the web page will automatically provide them. These files are temporarily stored on your computer and should be cleaned up regularly. When you browse the Internet, your computer stores a temporary version of the websites you visit on your hard drive so that it can more quickly load the web page. If you revisit the site, after deleting these files, your computer will download fresh copies of these files. Sometimes your computer will store a complete copy of a webpage you visit so that you can continue to view the webpage when you’re not connected to the Internet. You can safely remove these files. These files contain notes about programs that have crashed on your computer. If you provide these files to your software vendor, sometimes they can use them to determine what might be making your computer crash. Honestly, most tech support people have no clue what to do with a dump file. You can safely remove these files. Pretty obvious here… these are the files that you’ve deleted that remain in your computer’s recycle bin. If you’re certain you don’t want to use these files anymore, you can permanently delete them by selecting them and removing them here. Whenever Microsoft releases a major update to the operating system, they release what they term a service pack. Prior to installing the update, your computer makes a backup copy of the files the service pack will replace. This is so that these files can be put back if the update creates a problem. These service pack backup files can grow to be quite large over time as new service packs are delivered to your computer. After a service pack has been installed, and after waiting a while, it’s a good idea to remove them regularly to clear up drive space. These files are only useful when a software installation fails or is incomplete. These files can help technical support people identify what might not have completed successfully. In most cases, you should remove these files periodically. When Windows has an error, it will create these files. If you don’t have a problem with your computer, it is usually safe to delete these files. Software applications will sometimes store temporary information in a temporary file. When the software is closed, it is supposed to clean up after itself and delete these files. Unfortunately, sometimes the applications don’t automatically delete these files. They can pile up over time and need to be manually removed. During installation of your Windows operating system, these files were stored on your hard drive. Even though it may have been years since your operating system was installed, these files have remained on your hard drive. It’s safe to delete them. When you browse the folders on your computer, you will sometimes see small preview images of the underlying files. This is so you can identify what each file contains before opening the file. These are called thumbnails and are automatically recreated whenever needed. They can be safely deleted. Every time your computer downloads updates from Microsoft, it creates a copy of the update on your computer. As new updates are released, these older copies remain on your computer. These older copies can be safely removed. These files contain notes about errors that have occurred on your computer. If you provide these files to Microsoft, sometimes they can use them to determine what might be making your computer crash. You can safely remove these files. Once you’ve selected all the files you want to delete, you can click the OK button to proceed. 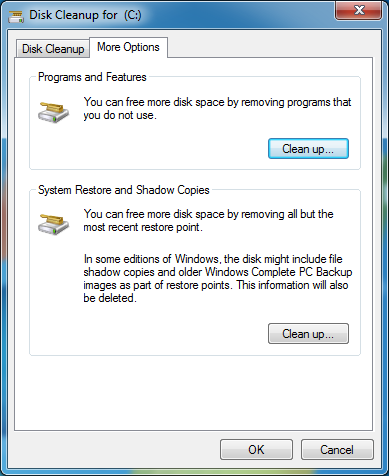 After the disk cleanup utility finishes up, it’s a good idea to restart your computer before moving on to the next steps. Make sure you bookmark this page so you can come back to it after your computer reboots. Open up the Disk Cleanup utility again now. You’ll notice that there was an additional tab at the top of the window called “More Options”. By carefully scrolling through each of the listed software applications, you can safely remove any programs you recognize that you do not use. This is where it will be important to only delete software applications that you recognize as unnecessary. There will be a lot of software listed here and many times, there are important software applications that you may use regularly but that you may not be familiar with. 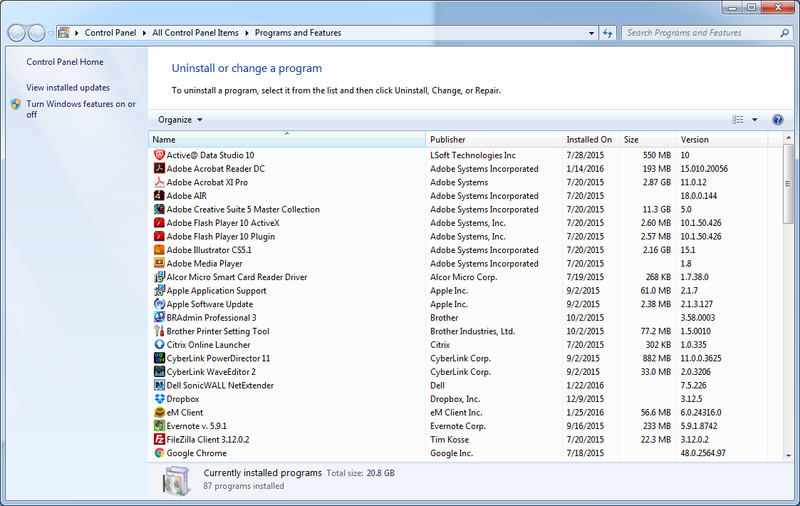 By carefully reviewing the software applications listed here, you can identify by Name, Publisher, Installation Date, total size, and software version. If you recognize software that is no longer necessary, you can select it here and then click “Uninstall” in the title bar. After removing all unnecessary software from your computer using this utility, it’s a good idea to do a complete restart of your computer. Make sure to bookmark this page if you haven’t already done so so that you can return here to complete the final step. The final cleanup we’re going to perform using the Microsoft Disk Cleanup tool is to remove all but the most recent backup. If you want to keep older backups, you can skip this final step. Otherwise, follow the instructions to remove them. 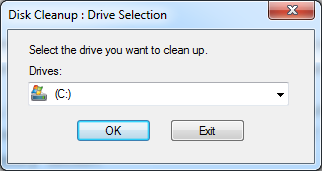 Open up the Disk Cleanup utility again and return to the “More Options” window. You’ll notice the final section entitled ‘System Restore and Shadow Copies’. You’ll need to click on the ‘OK’ button one final time to let the utility finish deleting all the files. By following the steps outlined in this article, you should have successfully cleaned up the majority of unnecessary files on your computer. By removing these items from your computer, your computer will be able to perform much better. Of course, there may be other things affecting the performance of your computer. Additional removal and cleanup should be performed by a qualified and competent IT technician. Our comprehensive managed IT services address system optimization and cleanup on a daily basis. All our customers enjoy the peace of mind in knowing that their IT maintenance services are completed regularly in the hands of our award-winning help desk. Please contact us if you’d like any additional assistance getting your computer performance optimized.